From one of England's most celebrated writers, the author of the award-winning The History Boys, a funny and superbly observed novella about the Queen of England and the subversive power of reading. 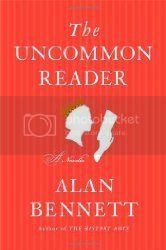 A surprisingly enjoyable little book, Alan Bennett's The Uncommon Reader is fundamentally a book about books and the power that they can have over our lives. When the Queen's dogs accidentally wander by way of a mobile library near Buckingham Palace, she feels obligated to check out a book. From there, she is enthralled by books and soon begins to become obsessed with reading, feeling that she has discovered something important to her that she has missed out on over the years. We get to see her journey as she grows as a reader to a most surprising conclusion to the story. This is the third time I've read this story, and I loved it just as much as I did the first. Bennett has constructed a great little story, and the ending is perfect. I love his portrayal of the Queen, and both how she deals with her subjects and how she is handled by those around her in her household and government positions. If you've never read this before, I'd highly recommend it. It is a very quick read and worth it. You won't be disappointed.